Sangeeta – Chitralekha Odissi Dance Creation Inc.
Odissi is the music of Orissa and the people of Orissa. It is very ancient: The earliest mention of Odissi dates from the second century B.C., during the reign of Kharavela. As time progressed, Odissi became an institutionalized part of Oriya culture. It was performed for Kings, during festivals, and in sacred temples where it was played in accompaniment to the ritual dance of the Devadasis. The great poet Jayadeva, from Kenduvilva, played an instrumental role in codifying ragas and talas, whereby the music of today is provided with a communicable mathematical basis. From its ancient vernacular, or Natangi, which was most frequently used in conjunction with the Mahari or Gotipua style of dance, it has metamorphosed into an internationally recognized classical discipline. At present, the resurrection of the original discipline of Odissi is not full-fledged; its parameters are defined but lack absolute fixity. Only through the vigorous effort of those who are Sangeet Vidwan are the minutae of this beautiful style being progressively illuminated. Today, the sound of Odissi is considered a middle ground between the Hindustani and Karnatic styles. Recognition is owed to those Gurus whose genius was a motive force in the revival of Odissi Music such as Late Sangeeta Sudhakara Balakrushna Das and Late Pandit Bhubaneswar Mishra. The Odissi Orchestra was formed based on the sculptures that are engraved within the sandstone temples of Orissa. Such sculptures depict Binadhaarini, the one who holds the six-string, Mardaladhaarini, the one who plays the Mardal Drum, Manjiradhaarini, the one who plays the cymbals, and Bansibaadini, the one who plays the flute. Traditionally, a bamboo flute is commonly used in all Indian classical dance forms. In the Odissi orchestra today, the Bina which is used in Bharatanatyam, has been replaced with the Sitar. A third instrument is the violin which not only plays the notation as the flute and sitar, but also plays the role of a vocal follow. These three instruments complete the Odissi orchestra when combined to Gita (vocals), the Pakhawaj or Mardal drum, and Manjira (the cymbals). 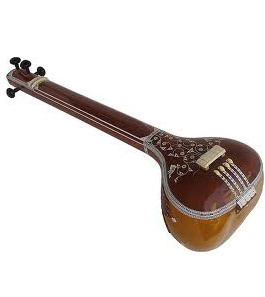 A Tanpura (the drone) is an optional instrument to maintain scale and is sometimes not utilized when the vocalist uses a Harmonium (a bellowed keyboard). If this is the case, an additional musician will sit in the orchestra playing the Tanpura. A Raga is a melody which is followed as a rule in Indian Classical music. It has a combination of notes that are used exclusively with an Arohana (ascending notes) and an Avarohana (descending notes). The Vaadi and Samvaadi are the emphasized and second most emphasized notes. A Raga has a Rutu (season), a Prahara (time of day), and a Pakkad (a riff which identifies itself). Some Odissi Ragas have similar names to Hindustani Classical Ragas and some Karnatic Classical Ragas. The traditional tunes which came from Natangi are defined as Mishra (mixed Ragas) which could be based on up to three Ragas sometimes. Today in Odissi Music compositions Mishra plays a big role, however, when using more of the popular Hindustani Ragas in Odissi, only small punches are made so the Raga does not become misunderstood.